One Of Those Days. :/ – Thar She Blows! Such interesting terraforming and rich landscaping. Lovely. Dunno if you sometimes experience this: You log in and everything appears to be perfectly normal. Your house and your neighbourhood rez beautifully and you look like super cute and all … and so you decide to do something. Ok, got that, so far. So my decision was to follow one of Inara’s “travel guides” to picturesque and interesting places, as I like to do sometimes. The place in question today was Kekeland, and whoa, it didn’t disappoint. Such a well tought-out and landscaped sim, with such a rich atmosphere is rare on the SL grid. For me Kekeland appeared like a mediterranean harbour town in northern or middle Italy. If I had to guess I’d say time period late 60s, early 70s. Only my Firestorm viewer, respectively the asset server I was on, or my connection sucked in a kinda sucky fashion. No, I wasn’t particularly laggy but I could move around, quick and responsive like a spring chicken. The Fiat Cinquecento is such a cute car. It would’ve been even nicer if one could pose in it. But the script was locked. Vespa scooters are as Italian as spaghetti, the overabundance of rearview mirrors are not. 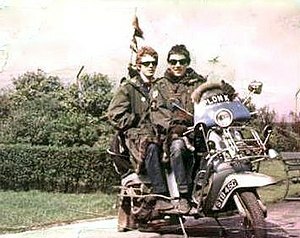 They are reminiscent of the English mods of the same time period. The blurring / de-blurring issue is actually local to you, not the CDN per se. In simple terms (to avoid TL;DR) is called “texture thrashing”. Your computer / GPU only has so much faster video memory – VRAM – (and SL only uses so much of that), and when there are so many textures in use (as within the town area of Kekeland, the available memory quickly gets used up (more so as many of the textures appear to be at the upper end of the resolution size, resulting in a large memory footprint per texture). When this happens, the viewer essentially starts “swapping” textures in and out of video memory as it tries to render all you can see. It is this “swapping” that makes things blur, de-blur, blur. It can be made worse when camming, as your field of view is constantly changing, and the viewer is always trying to “catch up” with you as you cam around. LL have done a lot to resolve this as an issue (notably by lifting the amount of VRAM SL can use to match the greater amounts of memory on the video cards that have come out over the last 5-6 years), so the issue is a lot rarer nowadays (and they are currently working to improve how textures as a whole are handled by the viewer to try to improve things). Kekeland is the first place I’ve experienced it more-or-less constantly in moving around the town area of the build; so much so that I felt an observation on the issue was worth including in my article. Of course first-time visits to place do have an impact, as the viewer calls the CDN for textures – and if the “local” CDN doesn’t have them, it has to in turn call the LL asset servers to obtain them. Sadly, not a lot can be done about that. Thx for the clarification, Inara. I knew this phenomenon from old times in SL, before I had a good GPU and a much worserer internet connection. That’s why I didn’t blame LL right away, as I would’ve liked to do. Well, I just installed my recent Linux distro yesterday, and of course same goes for the viewer and the Nvidia driver. So the viewer indeed had a lot of swapping to do. When you say not a lot can be done about it, it means I can keep my GTX770 for a while and don’t need to run out immediately and get a 1080 or sumfink?